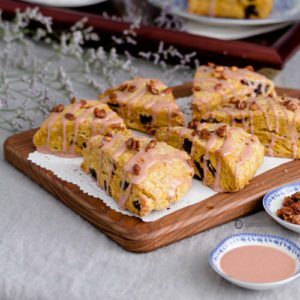 Cherry Pumpkin Scones is a fall-inspired pastry recipe, perfect to eat as a breakfast, snack or for an afternoon tea. These scones are slightly crumbly, and still soft with a crunchy topping of pumpkin seeds roasted in pumpkin spice syrup. The glaze on these pumpkin scones is heaven with a mix of sweet & citrus from the blood orange and the super delicious pumpkin spice syrup and powdered sugar. “No jars left behind” by using a leftover can of pumpkin puree and an already open jar of pumpkin spice syrup. Hello my friends. It has been a busy couple of weeks, and I didn’t have the chance to write my first blog post of October. As I mentioned in my previous post, I planned to publish two recipes per week, but sadly it’s not happening right now. The good thing is I already have three recipes done with pictures all ready to be released. And, it will be all about pumpkin dessert recipes, and they taste SO GOOD. I cannot wait for you to try them, and I just want to publish them all at once:). Right now I’m on a plane on my way back to Miami from Chicago after three days of training at the corporate office of my full-time employer. The weather in Chicago was fantastic; feeling the cool weather of the fall season. But I was surprised that I didn’t see too many trees/leaves with the fall colors. To be honest, I was a bit disappointed because since here in Miami we don’t have the opportunity to enjoy the changes of the seasons, I was looking forward to it in Chicago. I don’t know if I told you before that October is my favorite month of the year. Do you know why? Today is my Birthday (October, 13th)!!! Happy birthday to me….!!!! Besides my birthday, the 16th is Geoffrey and my anniversary of being together and this year is our 13th year, AND the 18th is our wedding anniversary too. I can’t believe how fast time flies. Ok… that’s enough talking about me. 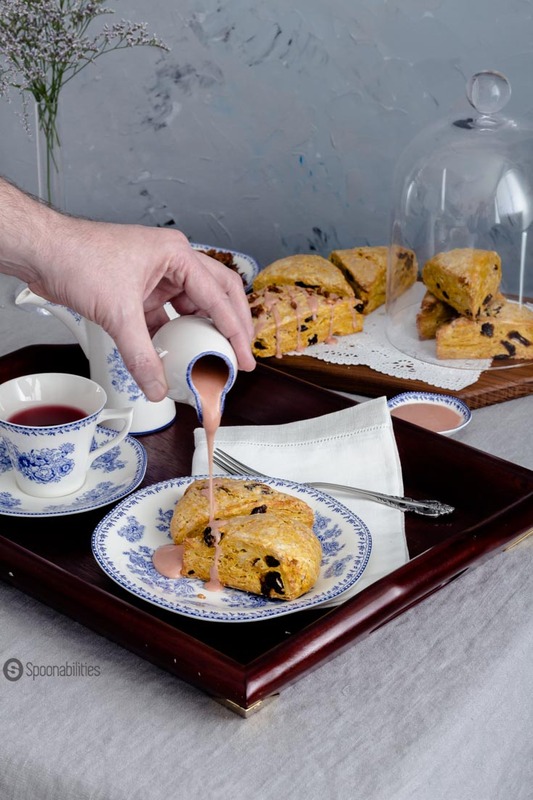 Let’s go to my kitchen and find out the details of my super delicious Cherry Pumpkin Scones with a beautiful pink citrusy glaze made with blood orange, powdered sugar, and pumpkin spice syrup. This glaze is incredibly tasty, and I added a crunchy and nutty touch with pumpkin seeds roasted with a bit of sugar and a couple tablespoons of pumpkin spice syrup. But, if you don’t have or don’t want to use pumpkin spice syrup, just omit it from the recipe. I will give you an alternative glaze that will be easy to make with some staple items that you probably have laying around in your fridge or pantry waiting for this recipe to be made. 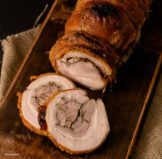 First, I wanted to share a couple of things I learned while I was making this recipe. 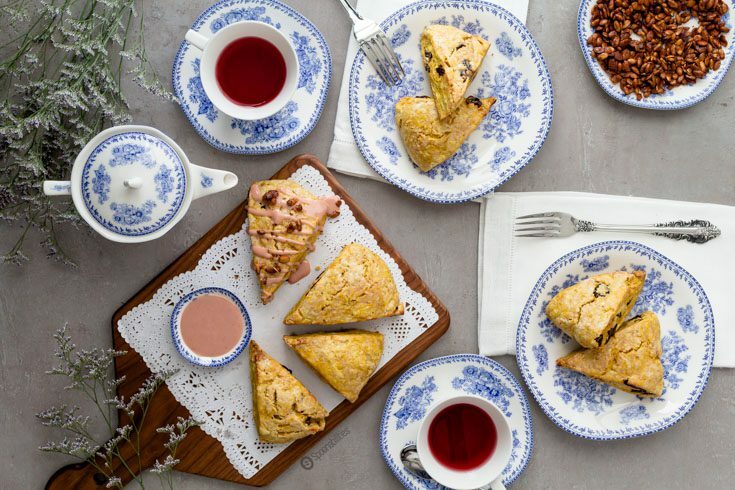 The first thing I discovered is that scones are originally from England and this pastry is traditionally served during tea time. The second thing I found out is that the classic British recipe is very different from the American recipe. Traditional British scones have flour, a little touch of sugar, baking powder, butter, milk or cream, seldom an egg, and perhaps currants or raisins. The scones in England are generally served hot. The Brits cut them and spread with butter or clotted cream, and jam or fruit spread. American scones are much sweeter, bigger, with spices like cinnamon, and moister than the British recipe. But, the American version is still flaky because we add more butter. 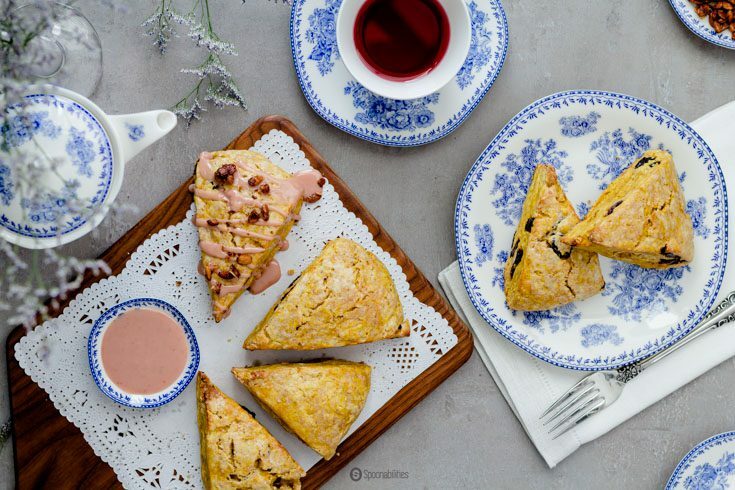 The American scones can be eaten without adding a spread or any other topping. Since I have been testing some pumpkin recipes since early September, I have a lot of half empty jars in my refrigerator and pantry. 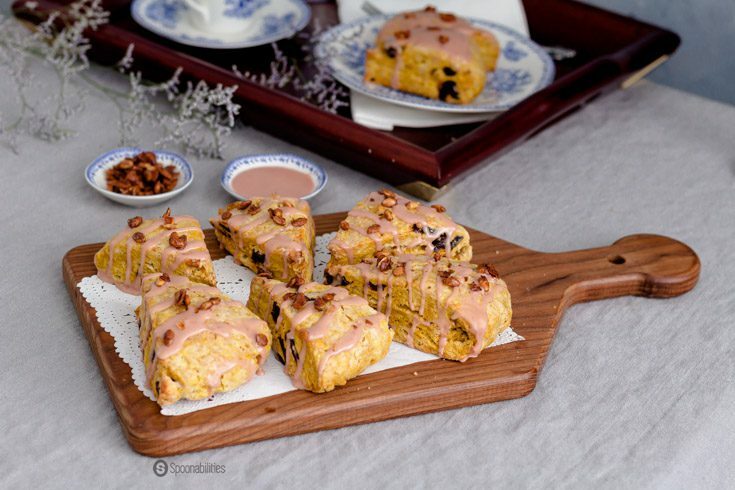 So I didn’t have to go to the supermarket for these Cherry Pumpkin Scones. I made the scones with a leftover can of pumpkin puree, already open jar of pumpkin spice syrup, and an open container of pepitas (pumpkin seeds). 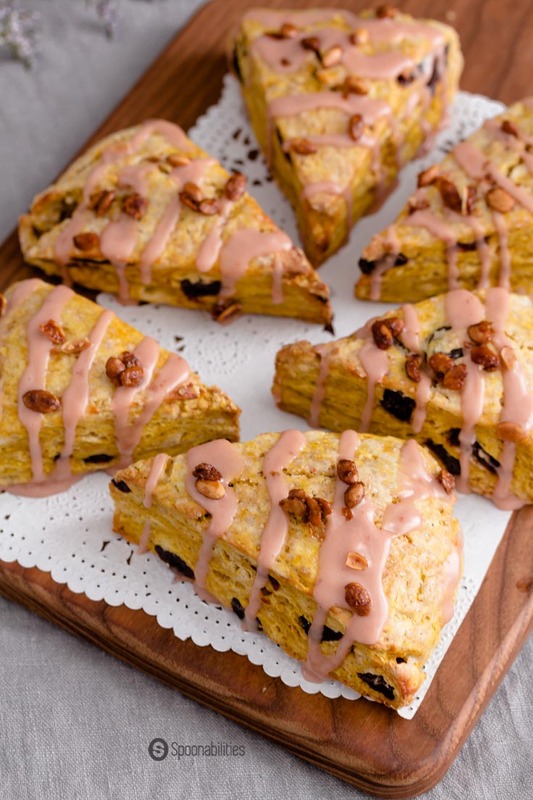 My original idea was to make these pumpkin scones with cranberries. However I also already had an open jar of dried cherries, which also happens to be Geoffrey’s favorite fruit. So, I switched for the dried cherries. If you don’t have blood oranges, you can use regular oranges. I made these scones with blood orange because I’ve had them on my mind, and they had some at my last visit to the farmer’s market. Besides, “blood” orange is perfect for the Halloween season anyway, right? 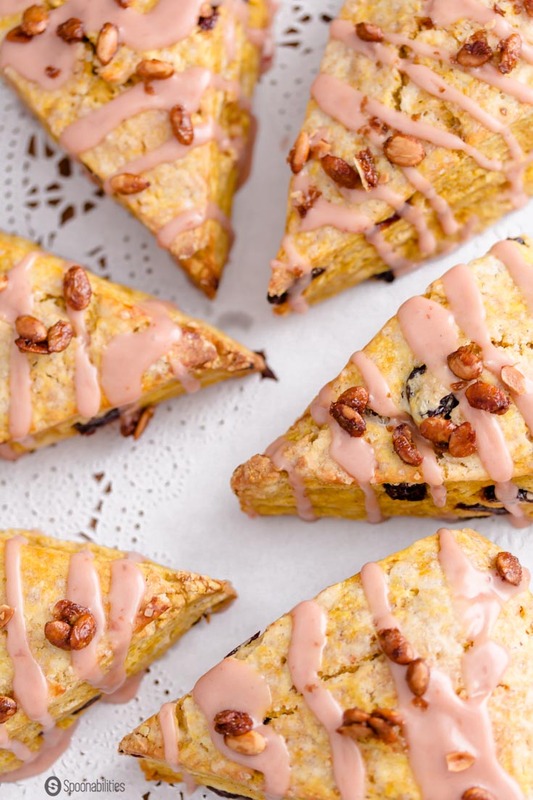 These Cherry Pumpkin Scones are very easy to make, but it’s essential to follow some steps to get the perfect scone texture and crumbliness. Keep the butter and the liquid ingredients cold in the refrigerator, even after you cut it in small cubes, until you are ready to mix it with the flour mixture. Mix using a pastry cutter until resembling coarse crumbs. The flour mixture has flour, brown sugar, baking powder, pumpkin pie spice, baking soda, and salt. Then, add the cherries and toss well. TIP: Put the pastry cutter and the bowl in the freezer for about 10 minutes before you start to make the scones. This step is not necessary, but helps to keep the butter cold. Remember the pieces of cold butter are what will create the flaky dough. Do not overwork the dough. After you stir the wet ingredient, just mix until is moistened. When you knead the dough on the pastry board, do it gently, pressing it for ten strokes or until dough is smooth. Wrap the dough in plastic and keep it in the refrigerator overnight. 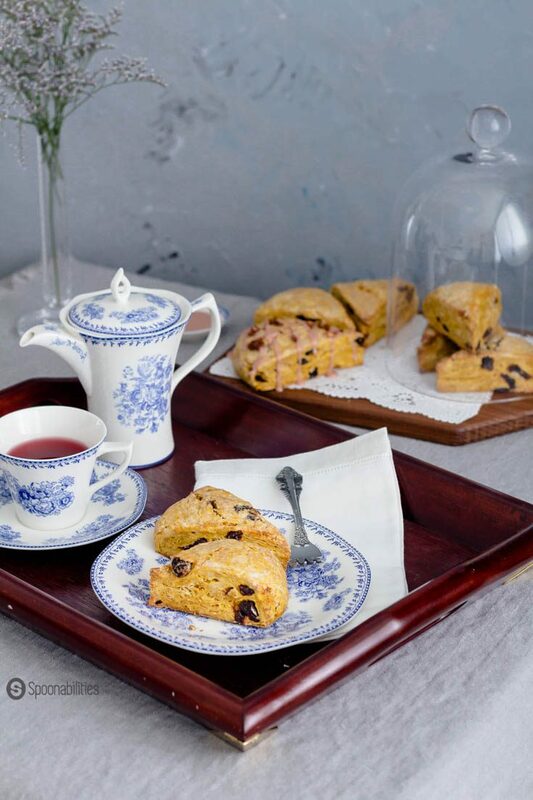 The benefits of resting and refrigerating dough for scones will allow the scones to rest, and help to relax any gluten developed during the kneading process. The same benefit happens with pizza dough when you let it rest overnight. Another benefit of this process is it bakes up taller, smoother, and with crispier edges. The next day, the dough will be easier to cut into a better symmetrical form and more attractive shape. If you have the opportunity to use European-style butter, it will be better because this butter has a lower water content. 8 Sweet Pumpkin Spice Recipes you will want to make! I declare the whole month of October a full month of celebration… not just for Pumpkins and Halloween, but for my birthday too. I’m doing a lot of traveling for business so I feel like I’m missing some happy birthday joy. I’m more than happy to hear any “spontaneous” happy birthday month wishes…hint, hint. Have a wonderful October everyone!! 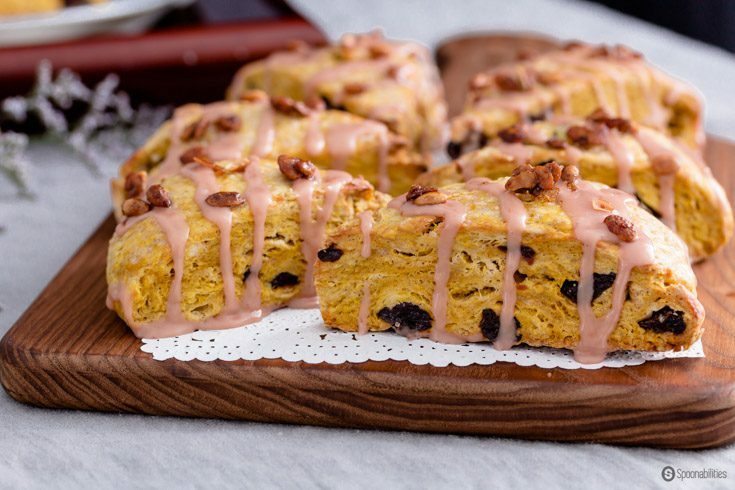 This fall-inspired Pumpkin Scone recipe is elevated with sweet & tart dried cherries. These scones are moist, soft but still slightly crumbly, and drizzled with a sweet and citrusy glaze made with blood orange and pumpkin spice syrup. The final touch is a sprinkle of roasted spiced pumpkin seeds. In a large bowl, stir together flour, brown sugar, baking powder, pumpkin pie spice, baking soda, and salt. Using a pastry blender, cut in the 1/2 cup butter until mixture resembles coarse crumbs. Add dried cherries and toss well. Set aside. In a small bowl, stir together the egg, buttermilk, vanilla paste and pumpkin. Add the pumpkin mixture all at once to the flour mixture. Using a spatula, stir just until combined. Turn dough out onto a well-floured surface. Knead dough by folding and gently pressing it for 10 strokes or until dough comes together and is smooth. Be careful not to overwork the dough. 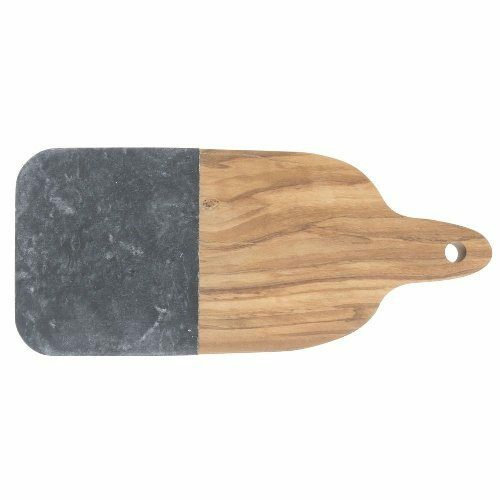 Roll the dough on a floured pastry board into an 8-inch wide and 1½”-thick circle. Cut into 8 wedges. Place scones on a large baking sheet lined with parchment paper. Brush scones with buttermilk and sprinkle with raw cane turbinado brown sugar. Bake for 20-25 minutes or until golden. Insert a toothpick into the center, and if it comes out clean with no wet crumbs, they are ready. Remove scones from baking sheet. Let cool for 5 minutes before spreading with glaze. In a small bowl, stir together powdered sugar, Pumpkin Spice Syrup, blood orange peel, and the blood orange juice until well combined. For alternative glaze, omit the Pumpkin Spice Syrup if you don't have this ingredient, and you can also use regular orange juice and orange peal. Spoon glaze over warm scones, spreading evenly. Sprinkle with some of the pumpkin spice pepitas and, if desired, additional blood orange peel. Serve warm. Preheat oven to 325 degrees F. Line a small baking pan with parchment paper; set aside. In a small bowl combine pumpkin pie spice, Pumpkin Spice Syrup & salted & toasted pepitas; mix well to combine. Spread the mixture in the prepared baking pan. Sprinkle with 1 TableSpoon sugar and salt. Bake for 15 to 20 minutes or until light brown and crisp, stirring every few minutes. Let cool on baking sheet. Makes 1 cup. 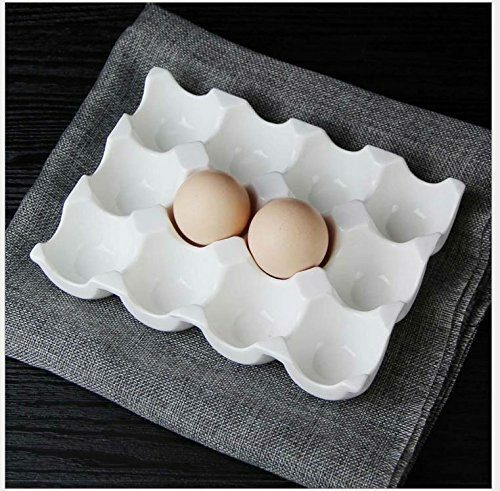 TIP: I freeze the pastry cutter and bowl to help the butter to stay cold. Store remaining Cherry Pumpkin Scones in an airtight container for up to two days (if you don’t eat them by then). Store remaining pumpkin spice pepitas in an airtight container at room temperature for up to 2 weeks. Use sugared pepitas on cheesecake, muffins, salads, or just to snack on. 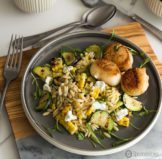 Your recipe looks fantastic but my favorite thing about this post are those gorgeous white and blue plants! Wowzers! Hi Alyssa, Thank you so much:). I guess you are referring to the plates. Yes, they are lovely and cute looking! My son would love these scones. They have all his favorite flavors. Definitely going into the “to try” file. Ellen, Thank you for stopping by. Don’t leave the recipe for too long in your “try” file, just print it:). 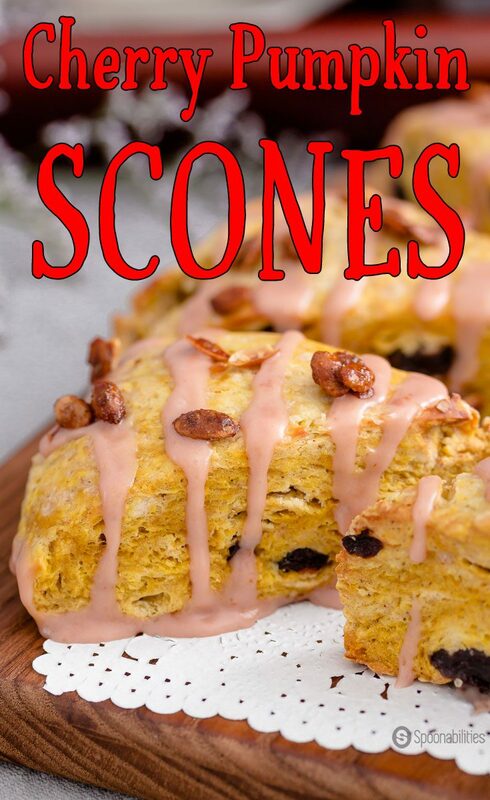 The season will be over soon, and I’m pretty sure you soon are going to love this scones. I’m having the same problem! I also wanted to post more stuff this month but sadly my first post was today… Hoping for a better rest of the month! The scones look so tasty and I love the blood orange twist for the glaze! Hi Olivia, I least I know I’m not alone with this problem. But, hopefully, this first post will help us to be more motivate us to release post more frequently. Indeed, the blood orange was the right twist for this tasty glaze. Have a wonderful weekend! Oh yum! I’d love one of these for breakfast right now. I think scones are such a versatile recipe as you can have them for breakfast, a snack or even dessert. Hi Corina, I would love another scone for breakfast right now too. They didn’t last too long on the counter. I kept eating them throughout the day. I love scones! I need to try this recipe soon, perfect for brunch! Hi Rika, Thanks for your comment! 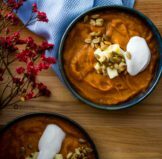 Try this recipe before the pumpkin season is gone. You are going to love! Wow! Such fantastic flavors! I love what you did! Thank you so much, Mimi:). Your feedback makes me so happy to hear! Happy birthday/anniversary/Congrats on your blog, guys!!! About two years ago I bought some orange cranberry scones and I was hooked!! I tried various recipes but couldn’t find a recipe that created a shortbread texture. My last attempt guaranteed a shortbread texture so I grated two sticks of frozen butter~any idea how long it takes to grate two sticks of frozen butter by hand~the processor thawed it. Any way, after all that effort they were awful. Your pics are so great I seriously thought about licking the screen but decided to make them later. Thank you so much Judy!! I don’t think I ever want to know first-hand how long it takes to grate frozen butter. Glad you didn’t lick the screen – it probably wouldn’t have tasted as good as the pictures. Do let us know what you think when you make the recipe!! FEED ME ALLA THESE. I mean seriously, they look perfect. So much flavor, and so darn pretty too! Thank you so much Early! They do have lots of flavor. Give them a try. Thank you so much, Valentina, for your sweet comment. 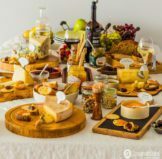 I’m SO HAPPY that you landed on our site, we love to see & hear our readers enjoining our recipes. I work pretty hard trying to get good pictures and still learning, and your feedback makes me feel so good to hear. Thank you so much! I didn’t realize British scones were so different from American ones! These flavors sound lovely! Mary, I was surprised too when I found out about the differences between the American & British scones. This is why I like to add to my post something that I find interesting in case others didn’t know. Thank you! This is hands-down one of the very few pumpkin treats that have excited me this season! 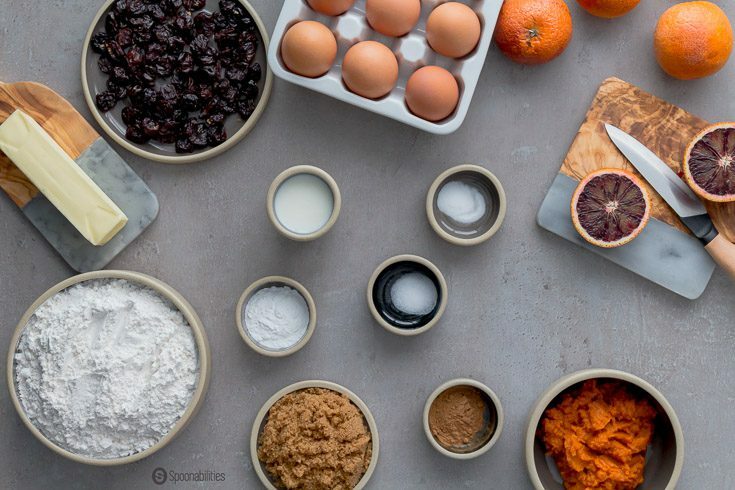 I’m not at all a pumpkin spice girl (my husband loves the stuff, though), but the thought of bringing cherries into the mix totally breathes life into this. Solid work! We are so excited that you are excited Dana! It can be hard getting excited about pumpkin after a while. So glad we could stir that up in your again! Cherries make everything better!! So glad that you love scones Jessica. You will adore these with that hot cup of tea. Enjoy! OMG! What a great recipe for scones. Pinning to try soon! When I was living in Miami I missed the change of season and all the yellow/orange colours. Those scones are a perfect replacement for a fall celebration in the Miami. They are spot-on orange and look delicious. Great pictures! Happy birthday and anniversary ! Hi Laura, I really wish that we could have the opportunity to see the change of the season. These scones were amazingly delicious! Thank you for stopping by.